Harry, bloody Potter! You can't move these days without bumping into some form of wizard merchandising. Carta Mundi's round playing cards are the latest in a long line of releases that has seen the young wizard being slapped on all manner of merchandise. Firstly, I have never really understood the phenomena that is "round" playing cards. They aren't easy to fan out in your hand when you are playing with them and you can't stick an elastic-band around them to keep them together in storage (well, not very well you can't). Now I've got that moan out of the way, while this deck of cards may be a little on the pricey side it's still money well spent - what else can you buy for under £7 that will provide so much entertainment? 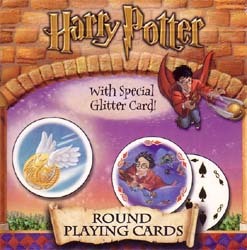 Also, the "glitter" card is sure to be a favourite amongst Potter fans - very collectible. This pack comes equipped with extra game rules - which will be useful to the youngsters who end up receiving these decks as presents. If you've got the dressing-gown, slippers, T-Shirt and underwear, your collection won't be complete without these cards.